A new musical composition expressing the movement of gases through the galaxy as musical notes, "Milky Way Blues" by astronomer Mark Heyer, a research professor at the University of Massachusetts Amherst, will be featured for the next 30 days on the website, Astronomy Sound of the Month. For the composition, Heyer developed an algorithm that transforms astronomical data about galactic gases into musical notes. "This musical expression lets you 'hear' the motions of our Milky Way galaxy," he says. "The notes primarily reflect the velocities of the gas rotating around the center of our galaxy." He points out, "Astronomers make amazing pictures, but they're a snapshot in time and therefore static. In fact, stars and interstellar gas are constantly moving through the galaxy but this motion is not conveyed in those images. The Milky Way galaxy and the universe are very dynamic, and putting that motion to music is one way to express that action." 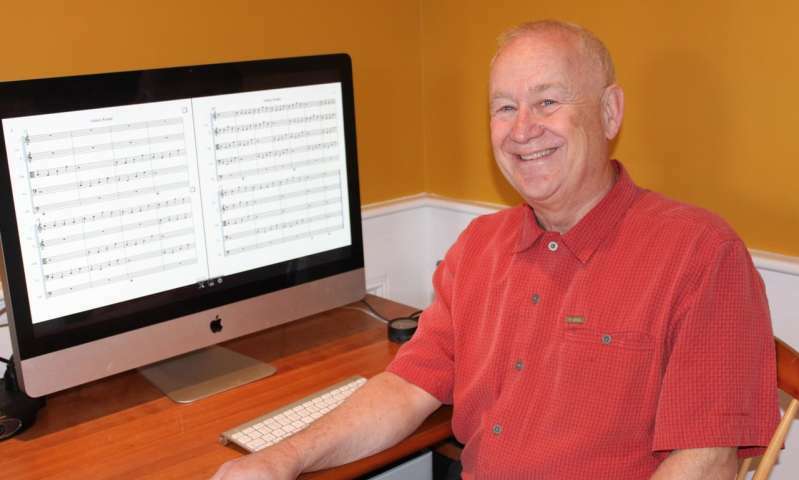 He chose to compose this piece using a pentatonic scale – with five notes in the octave instead of seven – and in a minor key, because "when I heard the bass notes it sounded jazzy and blue," he says. He adds, "I've been true to the data, I haven't massaged it to make it sound nice, but by turning what we actually observe with a radio telescope into a musical scale it gives us familiar tones that sound surprisingly like music with which we're familiar." His two-minute composition and video now online took several months to compose. "I love music," the researcher says, "So I do this for fun. I've had this idea for 25 years, but I never acted on it because I would have had to hire an orchestra to hear what it sounded like." Several years ago his brother, an amateur musician, told Heyer about composition software that could create a musical score from information created by his algorithm. The astronomer assigned instruments to the different parts and can play it back, allowing him to experiment with different ways of transforming the data. Heyer uses data sets created over the past 20 years by radio telescope surveys of the galaxy. His research area is the study of molecular gas in galaxies. He assigns pitch, the length of play such as quarter and eighth notes, based on the gas velocity and measured intensity. Two of the four instruments heard in "Milky Way Blues" are based on molecular gas – wood blocks and piano. He assigned a saxophone to play the ionized gas part and the acoustic bass to play the atomic gas part. To add a visual element to the piece, Heyer worked with another astronomer, Greg Salvesen of the University of California, Santa Barbara. Heyer says, "I can't give him enough credit; at one point I was stuck when developing a useful visualization to complement the music and he created a more informative and interesting animation." Greg Brooks, an amateur musician in Amherst also helped in the early stages, he adds. Heyer points out, "Each observation is represented by a line showing where the telescope was pointing and the positions of the circles along a line show the locations of the gas in the galaxy responsible for the played notes." The intensity of the emission coming from the gas is heard as longer notes and as larger circles. With every new measure, the lines swing around to new positions. "Putting it all together, the variation of musical pitches heard in 'Milky Way Blues' portrays the motion of gas as it orbits around the center of our galaxy," he adds. He notes, "I am certainly not the first astronomer to play around with the idea that music can be found in the elements of the universe. Johannes Kepler 400 years ago wrote 'Harmonies of the World' that described the elliptical orbits of planets around the sun and assigned musical notes based on orbital velocities. More recently, several groups have created sonifications of scientific data. Greg Salvesen's website, Astronomy Sound of the Month, offers a platform for such musical efforts." "You can just enjoy my compositions for the music, but if you want to follow the astronomy, that is there for you to learn about, too," he adds. "It's just a cool and different way to appreciate the two together."